This summer, I told you all about my own experiences traveling throughout Vietnam. 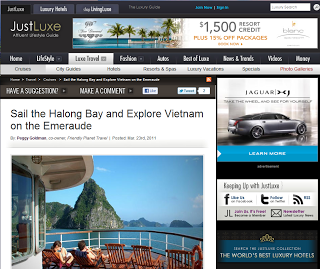 Well, one of my favorite parts of the trip was our stay aboard the Emeraude, in the beautiful waters of Halong Bay. 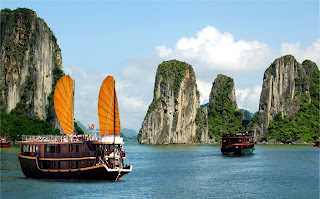 Anyone who visits Vietnam will no doubt want to visit Halong Bay. This amazing bay, a UNESCO World Heritage site is dotted with thousands of limestone karsts and isles. Local legend has it that long ago, when the Vietnamese were fighting Chinese invaders, the gods sent dragons to help defend the land. The dragons spit out jewels and jade, which turned into the islands and islets of Halong, forming a great wall against the invaders. Most tourists take a short cruise, half a day usually, to admire the beautiful waterway, but for those with a little more time and a flair for a romantic journey back in time, we recommend a night aboard the Emeraude, a replica, one-of-a-kind steamer from the French Indochina days. During the day, you cruise around one of the most gorgeous waterways in Asia. While you cruise, you can enjoy a terrific massage aboard or relax on the deck and admire the views. High tea is served in the late afternoon, and dinner aboard the cruise is excellent continental and Vietnamese cuisine. The Emeraude’s restaurant offers delicious, freshly caught local seafood and other specialties. While taking in breathtaking views of the bay, passengers can enjoy the delicious flavors of the local cuisine. From the sun deck, passengers can treat themselves to a soothing massage while sipping a refreshing cocktail and gazing at the rock formations reflected in the crystal clear water of the bay. The Emeraude’s swimming deck offers passengers the opportunity to swim in the cool waters of the bay surrounded by the majestic scenery. At dawn as the sun rises, passengers can participate in T’ai Chi class while taking in the calming silence of the bay. Cooking classes are also available on board, which I can tell you from experience is a wonderful and educational time! The decks invite sitting and enjoying the magnificent sunsets, and then, when it’s dark after dinner, guests can watch the film "Indochine" under the stars. The entire experience is very romantic and a true step back to another time. And (perhaps best of all) the cost for this wonderful experience is about $120 per person, including meals and accommodations. 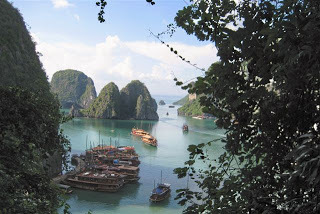 In the fourth part of My Journey through Vietnam series, I’m going to take you to the Halong Bay. If you want to catch up on my Vietnam travels so far — from the streets of Saigon to the waters of the Mekong Delta — you can have a look. After our wonderful visit to the Mekong Delta, we drove from Hanoi to Halong Bay, where a dense cluster of about 3,000 limestone islands and islets rise spectacularly from the sea. The islands are topped with dense vegetation, and a few have huge caves with gorgeous stalactites and stalagmites, one of which we visited later that day. Without a doubt, Halong Bay is among Vietnam’s most beloved and visited tourist attractions, and definitely deserving of its appointment a World Heritage Site. En route to Halong to board our cruise, we stopped at a special embroidery and handicrafts factory and showroom. Aside from being the best restroom stop of the trip, it was a chance to purchase souvenirs made by young handicapped Vietnamese artisans. The embroidered wall hangings and table linens were particularly beautiful, and — like everything else in Vietnam — very inexpensive. I bought a wall hanging was able to have my picture taken with the artist. He is deaf, and this job is one of the few, apart from rice farming, that he can do to earn money to support himself. We arrived at Halong Bay around midday, and settled into our cabins aboard the cruise ship Emeraude, then joined others in the ship’s dining room for lunch. I think I discovered my dream menu there in Vietnam. I couldn’t seem to get enough of pho, a light, delicious Vietnamese soup made with a lovely, delicate beef stock, rice noodles and aromatic herbs. The lunch buffet also had spring rolls, which are artistically wrapped with bits of shrimp, sprouts, green onion, basil, and cilantro, along with several types of sauces for dipping. There are other choices as well, but who cares, when I can enjoy pho and spring rolls? After lunch, we headed for the Hang Sung Sot Cave. 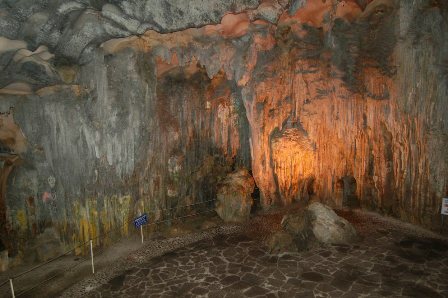 This cave, whose name in English means Cave of Surprises, was named by a French explorer who was amazed by the size and beauty of the cave’s interior rooms. It is probably the most beautiful of all the caves found in this region of Vietnam, with amazing stalagmites and stalagtites. When you exit the cave, you find yourself high above Halong Bay, peering at a gorgeous panoramic view of the water, the mist, the limestone karsts, and the women paddling boats laden with all sorts of things for sale — from conical hats to Ritz crackers and Oreo cookies. It was truly an amazing site. We returned to the Emeraude full of awe at the cave’s spectacular interior chambers, and I was again left wondering how I could be in such a beautiful place with such a painfully inadequate camera. 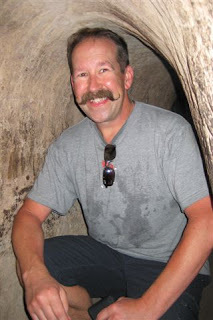 But the images of the cave and the incredible views of the Bay from high atop the water are very clear in my mind. That afternoon, while I took a cooking class conducted by the Emeraude’s chef to teach the art of making a spring roll, others in our group took advantage of a kayaking adventure offered aboard the ship. Many of those aboard the Emeraude enjoyed the rest of the afternoon and evening in the experienced hands of a Vietnamese masseuse. People were lined up for a treatment (more like a treat), and the women were booked up right through dinner. It wasn’t until after dinner, when everyone assembled at the ship’s bar and took their seats for the movie, Indochine, that the woman giving massages left the boat, hopefully having earned lots of money in well deserved tips. Finally, I settled into my seat for an evening of Indochine under the stars on Halong Bay. There was a gauzy fog draped haphazardly over the limestone karsts. But that didn’t obscure them or dim their beauty. 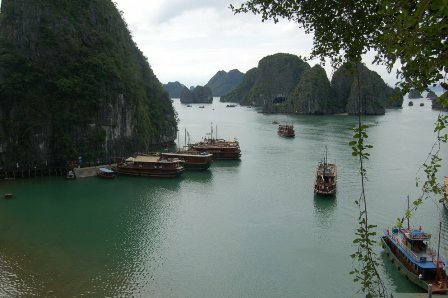 As the movie progressed, the familiar karsts of Halong Bay appeared, as lovely and mysterious on the screen as they are in real life. 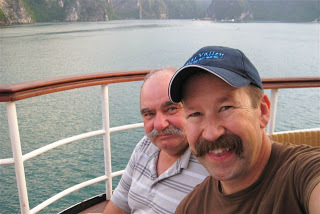 The next morning, we reluctantly disembarked and returned to Hanoi to continue our tour. We were already regretting the moment we’d have to leave Vietnam, and we still had some days to go. That, my friends, is the test of a truly wonderful destination. Not ever wanting the day of departure to arrive!